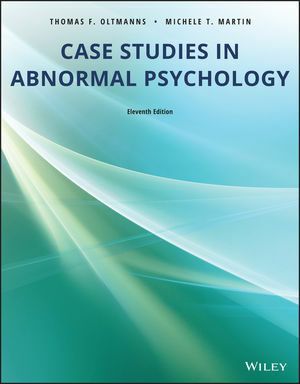 Case Studies in Abnormal Psychology presents actual clinical cases, providing developmental histories essential to appropriate diagnosis and treatment of mental disorders. This text presents 23 distinct case studies, applying abstract theoretical research to real-world situations. Each study describes the clinical problem, demonstrates the formulation and implementation of a treatment plan, and discusses evidence of potential causes and prevalence. This comprehensive examination includes cases ranging from psychotic and personality disorders including schizophrenia and bipolar disorder to those concerning child development and aging such as attention-deficit and hyperactivity disorder. Coverage of sometimes controversial subjects including dissociative identity disorder, gender dysphoria, autism spectrum disorder, and posttraumatic stress disorder ensures contemporary relevance. Suitable for undergraduate and graduate study of abnormal psychology, this book presents an honest and unbiased view of the limitations and benefits of various treatment plans. Discussions of alternative methods including medication, electroconvulsive therapy, and psychosurgery, augment primary cognitive-behavioral approaches, allowing students a solid foundational knowledge of the subject.